The workshop “Exploring Sonic Interaction with Artefacts in Everyday Contexts”, on 23 June 2008 at IRCAM (Paris, France) starts at 9:30. You can find information about IRCAM and how to get there on the ICAD website. 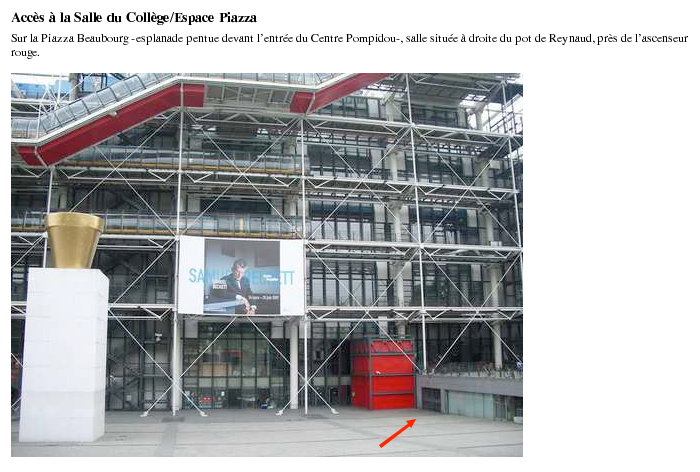 Our workshop will take place at Pompidou in Piazza room that you access from the Place Georges Pompidou. See Map here. Hands-on workshop on 23 June 2008 at IRCAM (Paris, France). This workshop introduces participants to the use of creative interaction design methods when exploring the design of sonic interactions with computational artefacts. Specifically, focus will be on physical interactions that rely on continuous sonic feedback. Participants will generate future scenarios and concepts for such interactions, and everyday sounding objects in context will be taken as a starting point. By taking part in the workshop activities, participants will get an embodied understanding of the challenges of designing for meaningful and engaging physical interaction with computational sonic artefacts. Methods employed in the workshop will thus be good complements to the cognition or technology-based approaches to designing sounding objects that are mainstream within the ICAD community. This one day, hands-on workshop will be divided in fours parts: warm-up exercises, creative idea generation, concept exploration through bodystorming and final presentation and discussion. The workshop is aimed at an ICAD audience, but welcomes a wide range of participants with various backgrounds such as artists, designers, musicians, programmers, cultural and media studies scholars, etc. No previous technical knowledge or design experience is required. The workshop will give participants the opportunity to explore key aspects of tangible interaction and continuous sonic feedback, all in an activity-based way: the fact that the workshop consists of low-tech small group exercises and interaction-focused creative activities instead of paper presentations or technology tutorials, invites participants to have an active role and to engage all senses in the exploration of this type of situated sonic interaction. The focus is taken away from technology itself and turned instead towards the situated activities of using technology. If you would like to participate in this workshop, please e-mail an expression of interest to sonicinteraction at googlemail dot com by 6 June 2008, as places are limited. Your expression of interest should explain in a few sentences why you are interested in participating in the workshop and include a short biography. The submission should not excess one A4 page. Please state if you are a member of SID or are applying for a Short Term Scientific Mission (http://www.cost-sid.org/wiki/STSMCall3). Acting out ideas with prototypes. Sonic play table in the background. Bodystorming the ideas from the design matrix (on the wall behind).